< TwinsTakes.com Blog on TwinsDaily.com - Our Takes, Your Takes, TwinsTakes.com! 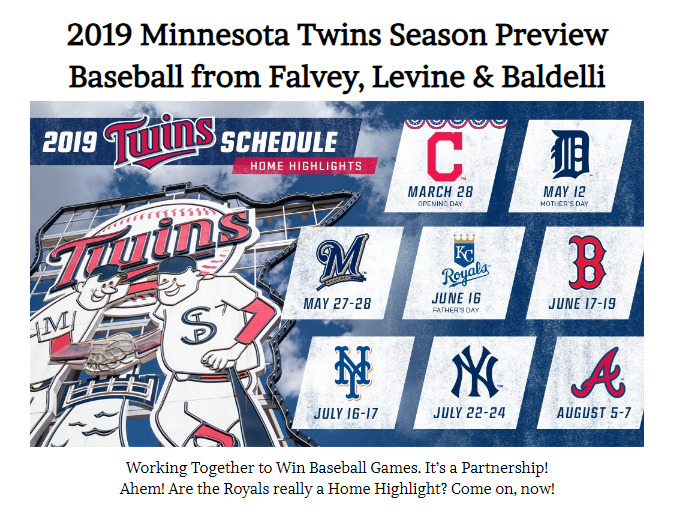 The Minnesota Twins embark on their 59th season and, maybe more importantly, their 3rd season under CBO Derek Falvey & GM Thad Levine, who have now added another “partner” in new Manager Rocco Baldelli. This is the Twins moving on from their past and into the next era of the Minnesota Twins. Will it work? Unfortunately, there is no way to know until we get through this season and, arguably, 2-3 seasons. We will see how this team develops throughout the 2019 season and that will tell us how it’s going and this season will definitely tell us if the Front Offices of Falvey, Levine & Baldelli are on the right track. Ahh...the old “future is now” saying. We’ve heard that before, huh? It has different meanings, though. For the Twins, it means they need to find out what they have in their young core players. They have a pretty good read on SS Jorge Polanco, LF Eddie Rosario, starting RHP Jose Berrios and reliever LHP Taylor Rogers. The rest of that young core is still up in the air on if they can be key parts to this team becoming a perennial playoff & championship-contending team. They aren’t completely sure what they have in CF Byron Buxton, 3B Miguel Sano, RF Max Kepler, OF Jake Cave, C Mitch Garver, RHP Jake Odorizzi and the two Trevors, May & Hildenberger. This is a big season for all of these players. They have a chance to secure their time with this team with good seasons. A good part of this offseason was about getting CF Byron Buxton & 3B Miguel Sano right after both of them had miserable 2018 seasons due to both injuries and bad play. They need to find out if either of them can be the impact players they have the potential to be and until they find that out, it pretty much keeps the front office from going all in on big-time free agents. The good news is both Byron Buxton & Miguel Sano realized that a lot of this is on them. They need to figure out how to be major league baseball players. Not only how to play but everything around the game. How to prepare both in the offseason and during the season for each game. It’s not as easy at the major-league level as it is coming up through the minors when their talent will get it done most of the time. This is a big part of failure being a reason for success. Ironically, weight was a big deal for both of them but Byron was trying to gain weight while Miguel was trying to lose it. Byron wanted some more weight on his body so he could take all the plays he makes in the outfield against the walls and the outfield grass. Miguel needed to lose weight so he could be more flexible and allow his body to handle the rigors of a 162-game major-league baseball season. They both looked great coming into spring training. Sano made some noise in the offseason by helping his Winter League team win a championship and he ended up getting a pretty good gash on his heel that will end up keeping him out until May. That’s a tough setback for Miguel. It was easy to tell that he put a lot of work into getting healthy this offseason. It is also easy to tell how disappointed he is to not be able to be out there with his teammates getting ready for the season. Just a couple days after the 2018 season ended, the Twins fired manager Paul Molitor. Derek Falvey probably would’ve fired Molitor after the 2017 season but they made the playoffs and he was named American League Manager of the Year. So they gave him a 3-year extension instead because his team did the unthinkable and made the playoffs after going 5-10 after the All-Star Break and being an under .500 baseball team. Then they went 35-24 for the last two months of the regular season and clinched a Wild Card spot. Remember, Falvey was forced to keep Molitor as his manager when he was hired in October of 2016 so it’s not that surprising that he’d want to bring in his own manager as soon as possible. So, a search began for the 14th manager of the Minnesota Twins. About 3 weeks later, they found their man in former Tampa Bay Rays outfielder and coach, Rocco Baldelli. Rocco has never managed a team before so he didn’t go over well with some Twins fans because, of course, they don’t know him, yet. They still don’t know him but from afar he appears to be a very down to earth person who likes to get to know people, how they tick and wants to know their opinions on baseball. That includes his players, too. Rocco is Falvey’s guy, a “partner” he can work with who enjoys all elements of the game of baseball, including the analytics side. He’s also very open to change and trying new things in the game. They’ve worked together along with the rest of the baseball operations staff to change a lot of how this team is run. They changed a lot of Spring Training to keep the players from having to be on their feet more than they need to and to keep them healthy throughout, especially the catchers. That will continue through the season as well and I’m sure we’ll hear some unorthodox ways the Twins are doing things. For me, it’s refreshing because they are trying to find ways to beat other teams on & off the field and the players have liked it, too. They are doing things that other teams might not be doing. For example, they are changing how catchers receive low pitches with different catching positions so the ump can see the pitch better so they can get more low strikes for their pitchers. One question a lot of fans will ask is how will Rocco do as a game manager? How will he manage his pitchers, the starters and the relievers and how will he manage his bench? I imagine this could be different than we’re used to as well. We already heard the Twins are going to begin the season with an 11-man pitching staff and a 5-man bench. A lot of that might be all the days they have off in the first 2-3 weeks of the season. They won’t need a 5th starter until April 16th. The Twins traded away some key players last season. IF Eduardo Escobar, 2B Brian Dozier, RHP Ryan Pressly, RHP Fernando Rodney, LHP Zach Duke and RHP Lance Lynn were all traded at the end of July through the end of August. Then 1B Joe Mauer announced his retirement in November so the Front Office had some work to do to fill those spots. They decided to make a waiver claim when the Tampa Bay Rays decided they didn’t want 1B C.J. Cron even though he just came off a season where he hit 30 home runs in his first season with over 500 at-bats. Did they not want to pay him? Or was it Cron turning 30 soon? They have Ji-Man Choi listed as their 1B. He brings about the same as Cron with better on-base skills and about $4M less in salary so maybe it was the money. A couple weeks later, the Twins filled their vacant 2B spot with Jonathan Schoop on a 1-year for $7.5M. Mr. Schoop had a rough season in 2018 after a breakout 2017 that saw him make the All-Star team and slug 32 home runs. Still only 27-years-old, he is betting on having a comeback season and cashing in on it for 2020. He still hit 21 home runs last season for a bad Orioles team and the playoff Brewers. He had a monster month of July with 7 doubles, 9 home runs & 19 RBIs which made him wanted at the trade deadline but he struggled with the Brewers. At the beginning of January, the Twins signed a player that may have the biggest impact on the 2019 Twins on and off the field as any other player added in the offseason and maybe any player currently on the team. Jonathan Schoop helped recruit him to the Twins, too. DH Nelson Cruz signed with the Twins on January 2nd for 1-year and $14.3 million. He has a big bat. Any player with the nickname Boomstick is probably known for hitting the long ball. He brings that for sure but he also brings some leadership into the clubhouse. He will help fill the void of the Joe Mauer retirement. A clubhouse leader is a big thing in today’s game. Cruz will help mentor the younger players. I’m excited to see how this affects a player like Miguel Sano. He may be the next Boomstick. The Twins filled their biggest needs with their early signings. All of the vacated spots in the field were now filled but they had yet to add anything to the pitching staff and everyone was hoping they’d add a couple pitchers to the bullpen. Free Agent relievers were coming off the board and we weren’t really even hearing the Twins were in on any specific pitchers, especially the ones that could really help their bullpen, the higher-tier free agents. The Twins do have RHPs Trevor May, Addison Reed & Trevor Hildenberger and LHP Taylor Rogers for the backend of their bullpen but why not try to improve that if you can with a free agent. That says quite a bit about what they think about high-priced free agent relievers. Does it have any merit? Well, the Oakland Athletics had one of the best bullpens in the league last season, 3rd with a 3.37 ERA & 2nd with a .220 Batting Average Against (BAA.) They were 25th (4.57) & 20th (.250) in those stats in 2017. They added Ryan Buchter (offseason) & Blake Treinen (2017 midseason) in trades and signed RHP Yusmeiro Petit in free agency. They also added Shawn Kelley, Juerys Familia & Fernando Rodney around the deadline for the stretch run. That’s a big jump to make in one season. Twins fans just want their team to have a good bullpen and they obviously don’t believe (yet?) that can happen with the pieces they have in place right now. That’s why they kept clamoring for Craig Kimbrel and likely still are. The Twins did sign veteran right-handed reliever Blake Parker to a 1-year/$1.8 million deal with $1.4 million in bonuses based on how many days he is on the Twins roster. He was the Los Angeles Angels closer in 2017 and 2018 and they released him in the offseason making him a free agent. He will add to the Twins options at the backend of the bullpen with the ability to strike out hitters. This is almost a test for the Twins new analytics staff and coaches. Can they get this pitcher with a pretty good arm back to being a serviceable pitcher or even better? Only time will tell but he’s looked pretty good in Spring Training. His velocity was up along with his strikeouts and his WHIP was 1.286. The Twins have one other recent addition to their major-league bullpen and he’s a pitcher who’s been with the organization for just over a year and today is his Birthday as he turns 30. Clarkson, Tennessee native, RHP Ryne Harper was lights out in Spring Training as he pitched 11.0 innings. He allowed just 7 hits, 2 unearned runs, 0 earned runs, 0 walks and he struck out 14. He was drafted out of Austin Peay State University (in Clarkson, Tennessee) in the 37th round of the 2011 MLB Draft by the Atlanta Braves. He’s been a professional baseball player for going on 9 years and that includes playing for 3 organizations and 13 teams over his 8 seasons. He signed with the Minnesota Twins in February of 2018 and started that season with the AA Chattanooga Lookouts and it took all of 4 appearances for him to be promoted to AAA Rochester but it then took all of 4 appearances for him to be demoted back to AA Chattanooga. So he got back to work and for the next 2 ½ months he pitched in 20 games before his results of 29 hits allowed, 16 unearned runs, 9 earned runs, 0 home runs allowed, 5 walks and 44 strikeouts over 34.2 innings pitched (2.34 ERA, .228 Opponents Batting Average, .256 OBP & a WHIP just under 1.00) got him promoted back up to AAA. Then he got on a roll and finished the season in Rochester. Over his 38 games last season, he had 2 games when he didn’t strike out a batter but he also had 30 games where he didn’t walk a batter. All in all, he had a great season and the Twins noticed and gave him an invite to Spring Training and the rest is history. He gets a lot of his strikeouts with his curveball and here’s the thing for me. I think it’s strange that over 8 minor-league seasons, a pitcher who has pitched over 450 innings can have a career ERA of 2.56, a WHIP of 1.140, walk only 135 batters (2.7 BB9), allow only 24 home runs (o.5 HR9) and strike out 553 batters (11.0 SO9) and not get much of a shot at the major leagues until now. Is it the low draft pick thing? Is his fastball not good enough? Is it the lack of analytics in the minors to know what the spin rate is on his curveball? That being said, it’d be great to find out how last season went for him as a member of this new era of Twins baseball where analytics is now a big part of working with and developing these players. Geez! I rambled there, didn’t I? Everyone figured the Twins were done signing free agents but with some quality players still out on the market late in Spring Training and knowing what the Twins did last offseason late in Spring Training, it probably shouldn’t have come as much of a surprise that they went out and signed super-utility “multi-positional everyday player” Marwin Gonzalez to a 2-year, $21 million contract but it still was a surprise. The Miguel Sano injury may have been a reason to go get Marwin. Knowing they’d be without Sano until at least May may have made them look for an upgrade to their bench, even though Marwin isn’t necessarily considered a bench player to them. Swiss G? If you don’t know what that means, it comes from Marwin Gonzalez’ agent, Scott Boras, who calls him that because he plays everywhere and do a lot of things like a Swiss Army Knife. He has a good bat and was a big reason the Astros won the 2017 World Series. He even received some MVP votes. He wasn’t as good in 2018 and he’s had a rough Spring Training at the plate but he’ll be the starting 3rd baseman for the Twins so we’ll find out if was taking his time getting into the swing of things. Since Marwin can basically play everywhere, it really makes me wonder if they will keep or need a 4th outfielder. Right now, he’s the starting 3rd baseman but once Miguel Sano gets healthy when May hits, someone will have to go from the bench. Will it be OF Jake Cave who still has options remaining or Tyler Austin who doesn’t have options remaining? This question may be answered by how these players play in the next 4 weeks. The Twins have a roster crunch coming anyway since they are starting the season with 11 pitchers and 14 positional players. Two and a half weeks in, on April 16th, they will need a 5th pitcher for the rotation so Martin Perez will move from the bullpen to the rotation and the Twins will call up a pitcher to relief pitcher to replace him. Also, at some point RPs Addison Reed and Matt Magill will come off the injured list so, are the Twins already letting teams know Tyler Austin is available? So, with all the additions to the 2019 Minnesota Twins, where will it take them? The Cleveland Indians have been the class of the American League Central Division for quite a while but they didn’t really do very much in the offseason. They did very little for their bullpen or their outfield but they still have Jose Ramirez, Francisco Lindor (hurt?) and that starting rotation. The Twins have narrowed the gap between them and the Indians and I think Rocco will keep this team feeling good and happy throughout the season. Jose Berrios will be even better than last season, showing more consistency on the mound. Kyle Gibson will start slow but be the much of the same pitcher he’s been for the last year and a half. Miguel Sano will surprise us all when we get to see him show off in May. The analytics staff and new pitching coach Wes Johnson will show their merit with Martin Perez and the bullpen arms and come out on top in the end. This lineup is going to hit a lot of home runs and the rotation will get a bounce-back season from Jake Odorizzi and a return to form for Michael Pineda and we will see Byron Buxton running around the outfield and the bases all season long. Wow! That’s a lot of things going right. The Twins will have some ups and downs and some injuries, too, but they’ll deal with them and move on with the next man up with great leadership from Rocco and Nelly Cruz. It’s taken a while for the Twins to get to this point but this will be the season the Twins show promise for the future in the present as they complete a move to the modern era of Major League Baseball and it’s no longer about implementing analytics, It will just become part of what they do. Those are our TwinsTakes on the 2019 Minnesota Twins! What are your TwinsTakes? Let us know in the comments or on social media via Twitter, Instagram or Facebook. i just remember how the 1991 team flew under the radar until like June. → TwinsTakes.com Blog on TwinsDaily.com - Our Takes, Your Takes, TwinsTakes.com!